The Photo falls under Minimalism as Less Elements category of Minimalist Photography. The only element here being the Ripples in Water though, the Photography is a bit Maximal in Nature. We would not call it Minimalism as in Repeating Shapes because the Shapes, although look similar from a distance, but in fact each Water Ripple has its own unique shape. I Hope you enjoyed the Shot. 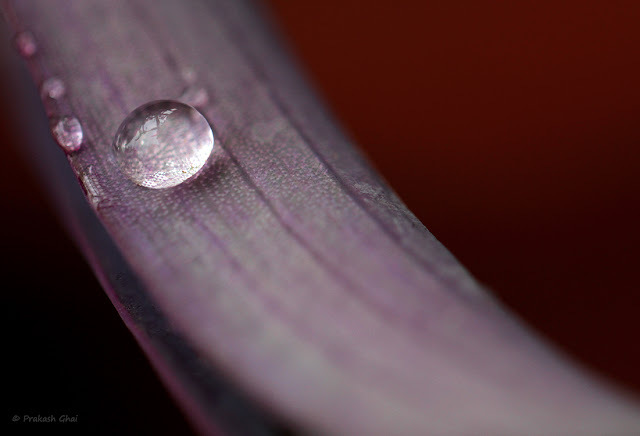 Today, I wanted to share this photograph of a Solo Water Droplet. The reason why I am sharing this photograph today is that It goes with my current mood. This Photograph completely goes with that mood. And Hey ! This is the purpose of Art is. Isn't it? When people can relate their mood, life events, feelings etc to artworks/photographs, their connection to the piece of art goes to another level. 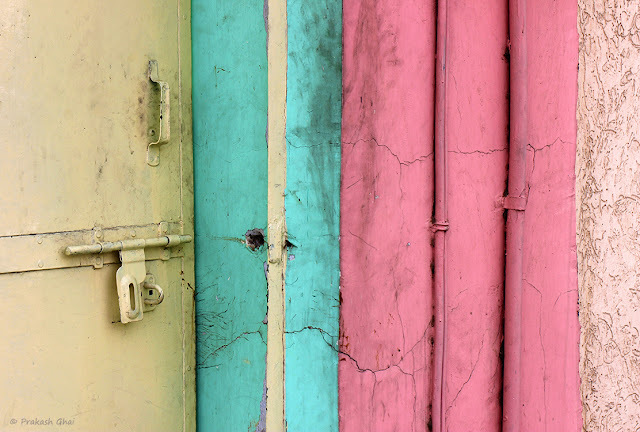 Minimalist Photography is not about Flat Photographs. We need to make the photos Artsy too, as often as we can. And that is a big challenge. Now, you may tell me that hey, you are relating this photograph to a mood after taking the shot. So this is not the shot that you initially planned capturing. My answer to this is simple ! What does a photographer shoot? Well.. He either shoots his conscious mind or his subconscious mind. So there must have been an hidden emotion/thought/feeling at the back of my mind, while I was capturing this shot. And, its only now, that I have discovered that as to why I clicked this Photograph in the first place. So basically, if one studies his own shots closely, he may able to understand what goes on deep down within one's subconscious mind. Now, Lets take a look at the Simplistic Composition. All that I tried to do here, was to create a curve with the violet leaf and get the background blurred. Other than that, just as usual I left negative space. Of course you need a Macro Lens for this. The one that I used here, is the Canon 100mm Prime Macro 2.8 L Series. 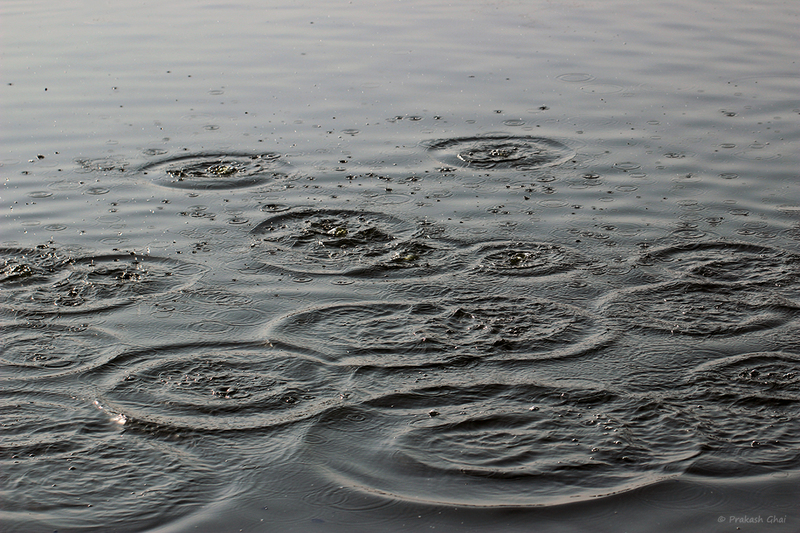 I really love shooting Water Droplets, that are formed post rain. I do not like to recreate them in a controlled environment, because the feel is completely lost then. I did a Macro Water Droplet series earlier. In case you missed it, then please check the link below. This shot falls under the Minimalism as in Repeating Shapes Category. What we have here, is a repetition pattern created by the Windows of the rooms of a hotel in Jaipur. I have purposefully placed the Green Tree on the bottom left corner of the frame, so as to break the Pattern of Repetition. Without the Green Tree, the shot would be too vanilla, at least for me. I shot this from an over-bridge, in-case you were wondering from where I got the height in the frame. Its the result of the over-bridge elevation, that I am looking-up but yet my view is kind of flattish or parallel to the ground. Other than the height, the 100 mm Macro Lens helped me to shoot this comfortably from a distance. 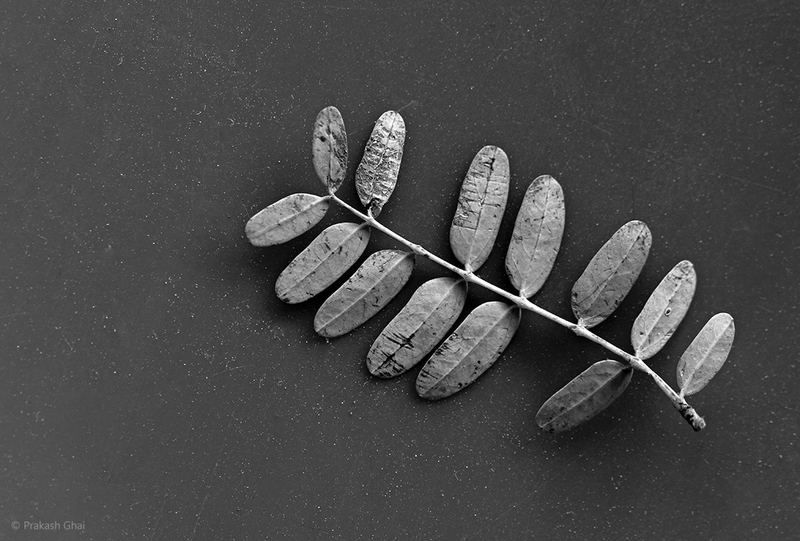 Black and White Minimalist Photography using Less Elements. 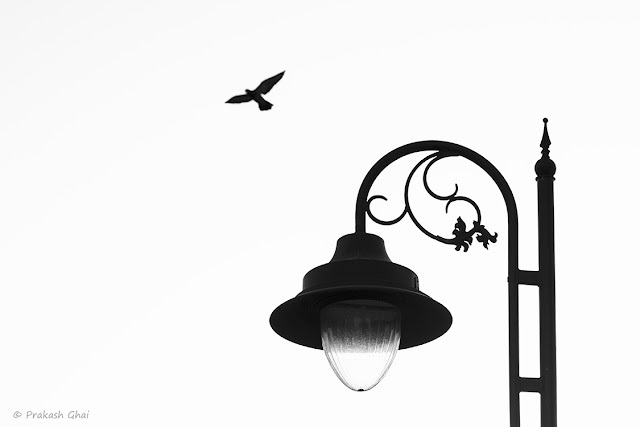 A Bird Flying across the sky contrasting well to the stationary Street Lamp. - Exposure time: 1/800 sec. My posting schedule seems to be as random as the shape of the clouds in the sky. I believe those who have subscribed to my blog posts via e-mail must be getting my mails when they don't expect and vice-versa. Never mind, since I am yet not full-time into photography, my posting schedule is going to be the same. I open my laptop less often these days. I just came here today to randomly check my mails and some other social profiles. Usually I am glued to my phone for the same. So, today was different. Since I was getting bored I got my ear phones on and started listening to a latest Bollywood romantic song "Mai Phir Bhi Tumko Chahunga" (in english "I'd still love you",) from the new Bollywood movie Half-Girlfriend. While I was doing that, I thought why not open my Minimalist Photography Folder and check the edited pictures in it. The above photograph has been edited about 4 months back but I had still not posted it. Something stopped me every-time I tried to post. While I began writing this post, I observed the Photograph carefully and then I realized it actually relates to the song I am listening to. So, my sub-conscious mind made me select this photograph by correlating the words of the song to it. The song's lyrics are "I'd still love you" the rest of the assumption in general is "no matter what"... So, "I'd still love you, no matter what". If we consider the stem of the plant with leaves, as a person who was in love but got heart-broken. The same is represented here by both The Missing Leaves and the Lack of Color in the Photograph ie. it being Black and White. You might think I am crazy but for me this is the plus side of being a Minimalist Photographer. My sense of observation has increased a lot and I am able to now co-relate things. The Composition is quite Simple. Just place the subject in the right, and leave some empty space. That is all. But wait, this is Gray. Gray is challenging to edit. Make sure to adjust the Highlights and Contrast in the right proportion. This took me a very long time to edit, just to get the gray right. The Photo, as most of my Minimalist Photos, Falls under the Minimalism as Less Elements category of Minimalist Photography. I found the leaves lying on a plastic chair near a road side kiosk, that sells bangles near Jantar Mantar, Jaipur. The Lens that I used was the Canon, 100 mm prime macro lens. Thank you for reading this till the end. Greetings once again. Today, I have a Street Shot to share with you all. I guess it was about time that I posted something different. So I flexed my creative muscle. This shot was taken today at about 4.45 pm. I stopped over a bridge/flyover with nothing in mind actually. There are two railway tracks under it, so trains keep passing by from there. I just stopped to have a look. I knew I would not be shooting the trains of course. Then, while I was observing the railways tracks below, I saw a few people passing by the street. I had a good look at the shadows being casted by them while crossing the street. I became pretty interested to find a subject and tried shooting different subjects that passed by the street from various angles. I missed a long shadow shot of an old man, another one of a bicycle's shadow (but that would not have been minimalist). I also missed quite a few other people who passed by. By missed I mean, I missed the shots and I deleted them on the spot, for I was not happy with the compositions. I could neither get the Street Photography shots right (that I shoot and keep for myself and not post them here) nor the Minimalism Shots right. I told myself, never mind this happens. 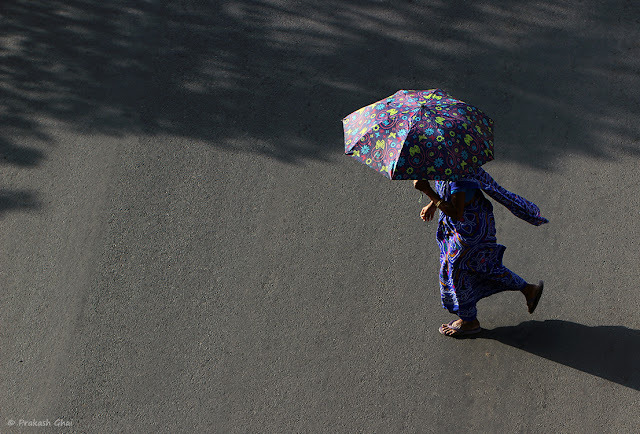 Then I spotted this Lady in Blue Saree with an Umbrella in her hand walking towards my frame. She was a little far, so I had to wait about 30 seconds. 30 Seconds is too long a wait for me, ha ha, I have less of patience and even lesser in summers when it is 45 degrees. Yes, today was hot as well. In the initial few shots that I took, The Lady in the Blue Saree, was just walking downwards towards me, from North to South and that was giving me a lot of clutter in the frame. I had the lady, the bus next to her in the parking, a car passing by and what not in the frame. Yes, this was my moment to de-clutter and I knew it. Finally, I could now remove the unwanted elements from the frame. She moved from left to the right of the frame, while crossing the street, while her earlier movement was from north to south. I wasted 3 more clicks, but in the 4th one, I was finally able to avoid the street traffic completely in the frame. I had to be fast but at the same time, I had to leave negative space on the left following The Rule of Thirds. The Rule of Motion is also followed here. That rule says that one should leave space in front of the moving subject from where he/she/it is traveling to, to create a sense of motion in the minds of the viewer. Like here, when you see The Lady, you know she is going to travel from right of the frame to the left and there is physical empty space in front of her to do so. Also note that here. The Rule of thirds and The Rule of Motion, actually Overlaps. 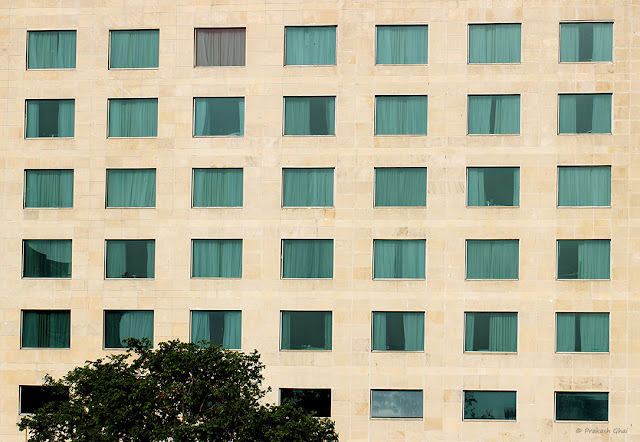 The Photo falls under the Minimalism as Less Elements Category of Minimalist Photography. The primary element here being, the Lady In Blue Saree with carrying an Umbrella. The Street and Shadows acts a tiny supporting elements. Hope that you enjoyed this street shot and my little explanation. Last Sunday was quite hot. About 45 Degrees. That's how hot it is in India in May. I took this photograph roughly at about 4.30 pm and the temperature was 42 Degrees then. I was on my bike as usual roaming around taking random turns, entering different streets every-time. That is how I hunt my shots. This was my first shot that day. After this I took about 10 more shots but I was done for the day. I got dehydrated due to the maddening heat and got a headache as well. I was hoping for a longer time out, but well, one should not complain. There is always another day to look forward to for great photos. The photo above of the Unlatched Door, falls under the Minimalism Category of Less Elements. I want to make one thing clear here, that there should be no confusion regarding the Minimalism Categorization here. No, This photo does not fit under the Minimalism as Few Distinctive Colors Category, because its pretty evident that the Open Latch is my primary subject and that's what I want to show to the viewer first. The green and pink bars are added just to support the main subject. They add variety as the viewers eye travels from the left of the frame to right, after having a good look at the latch. So, that explains it. Hope you like the photograph.